According to the 2017 Homeless Point-in-Time Count, of the 1,100 people experiencing homelessness in Marin, only 15% were employed. Despite this low rate of employment, of the people who were unemployed, only 23% reported being unable to work. Therefore, there is a tremendous opportunity to help people experiencing homelessness in Marin reenter the workforce. Housing “affordability” is often discussed in the context of housing prices, but it is equally dependent on how much we have to spend. For most of us, how much we have to spend is dependent on the wages we earn at our jobs. According to a recent story in the Marin IJ, the median price of a one-bedroom apartment in San Rafael is $2,580. You would have earn $103,000 a year to afford the median one-bedroom apartment in San Rafael. 70% of Marin’s workers earn less than that. 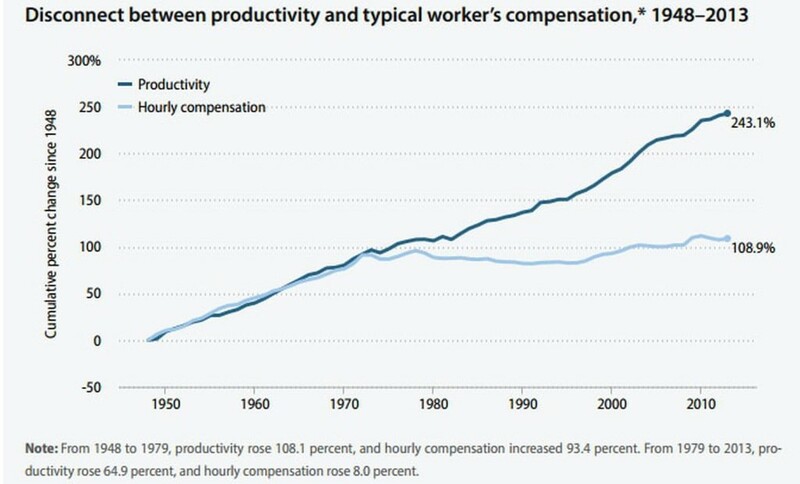 Since the 1970s,the economy has continued to grow, but for the average worker, wages have stayed flat. Why? How Does the Economy Grow? Economic prosperity is typically calculated by measuring something called GDP (Gross Domestic Product). GDP is a fancy way of saying “the value all of the goods and services produced in the economy.” At the end 2017, GDP in the US was $19.7 Trillion. To get per capita (i.e. per person) GDP, you divide that number by everyone in the country. $19.7 Trillion divided by 323 million people is approximately $61,000 per person. Controlling for inflation, our country’s per capita GDP has steadily climbed over the last 150 years. In the 1860s per capita GDP was comparable to modern day Pakistan. Today it is the 20th highest in the world. In order to increase GDP – and thus wealth and prosperity – you have to grow the economy by creating more goods and services. To understand how that works, imagine we live on a small island with 1,000 people, and the only items our island’s economy produces are huts and coconuts. How could we increase the amount of goods and services we produce? We could have more children and increase our population to 2,000 people. With more workers and inhabitants, we could harvest more coconuts and build more huts. Someone could figure out a new way to harvest coconuts or a more efficient technique for building huts, thus making labor more productive (i.e. the same person can create more in the same amount of time). Someone could figure out how to make fishing poles (i.e. create a new physical technology), and thus add fish to our economy. Someone could figure out the concept of home insurance (i.e. create a new social technology) and create a new marketplace insuring beachfront huts. We could discover a new island with new people (i.e. new trade partners) and begin to exchange coconuts for bananas. In this simple example, we see all the basic ways in which countries can grow their economic prosperity, and in the process, we see that there are real, tangible benefits to growth and increased productivity. Because of a growing economy, we now get coconuts more quickly, we have better constructed homes that can be rebuilt if there is a storm, and we get to consume new items like fish and bananas. When we sum all “economic activity” to get GDP, we are actually adding together the economic output of the millions of individual businesses in our country, and it is at the individual business level that most wage decisions are made. To understand how this works, imagine a business called “Bob’s Burritos.” Bob started his business 10 years ago. Over that time, he committed to paying himself $50,000 a year and investing the rest of his profits into expanding the business. This proves to be an excellent strategy, and after a decade, Bob has 10 stores throughout Marin County, 100 full-time employees each earning minimum wage (approx. $20,000/year), and the business is making $1 million a year in profit. What are the implications for wages in this scenario? Bob decides to stop growing the business knowing he will make $1M a year. He gives every employee a $7,500 raise (they’re now making $27,500 per year), and pays himself $250,000 every year. Bob decides to “take his company public”, i.e. list it on the stock exchange. Bob now owns 51% of the company and investors own 49%. 51% of profits go to Bob, and 49% of the profits go to investors. Bob takes the company public, but gives employees stock options, so they share in the growing profits. The employees form a union and are able to negotiate a pay raise or profit-sharing on their own. The local government increases the minimum wage to $20/hour, meaning his employees will now make $30,000 a year. The federal government requires increased employer spending on benefits like healthcare, which leads to non-wage compensation. The local restaurant sector is so strong and robust that employers have to keep paying higher and higher wages to attract workers. Alternatively, Bob’s Burritos becomes so dominant that it is one of the only food employers in Marin and can thus use its monopoly power to keep wages low since workers have few alternatives. Culinary workers could get fed up with with Bob’s near monopoly, so they move to a new area. Wage and income stagnation are often highly politicized topics, and the causes are multi-faceted. The share of income going to employees is on the decline and the share of income going to management is increasing, union membership is down, the minimum wage has not kept up with increasing growth, companies are spending more money than ever on stock buybacks, the government has required businesses to pay more for non-wage benefits, some industries are more monopolistic, and fewer Americans are moving. In Marin, 15% of the people experiencing homelessness are actually employed. 42% of people experiencing homelessness in Marin said economic issues were the primary cause of their homelessness (the most cited reason). 67% report that financial assistance is needed to exit homelessness. In this context, wage stagnation, especially relative to the increasing cost of housing, is one of the biggest contributing factors to homelessness in our community.